How do you release a clip from a mystery show’s second season without spoiling the mystery? Simple: Show a character denying all knowledge of everything. It’s an inspired choice of clip for Stranger Things 2, which finally arrives this Friday on Netflix. There are a heap of unanswered questions from Season 1, from Sheriff Hopper (David Harbour) getting in that car to The Bathroom Incident and not to mention the Eggo sitting out in the woods… And this teaser video doesn’t tell us the answers to any of them – but it certainly makes you impatient to find out for yourself. It also sets the tone for the sequel, as the adult authorities become more and more prominent following the incidents of the first season – and, as they try to track down Eleven, our group of kids are going to feel even more protective of their shared adventure and its underlying horror. Stranger Things 2 launches on Netflix on 27th October. For more on the show, see new photos of Season 2 here, along with details of the new faces in Hawkins this time around. Or, for even more Stranger Things, read on below for the other trailers for the show’s return. New footage from Stranger Things Season 2 has been released online – and it promises all kinds of gooey horror on the way. Featuring Millie Bobby Brown as Eleven, the clip was released exclusively by MCM London Comic Con, which takes place in the UK capital from 27th to 29th October. The only reason you might not be attending? Because you could be at home streaming the whole of Stranger Things 2, which also premieres on Friday 27th. The footage sees Eleven attempting to break out from the Upside Down – a reminder of just how creepy the other worldly sci-fi of Netflix’s retro series can be. The Duffer brothers, who created the first season, have promised that Stranger Things will expand its scope a little bit beyond its home town Hawkins, and that new faces will also be joining the cast. You can see those new additions in some photos of Season 2 here, along with details of the characters. Or, for even more Stranger Things, read on below for the other trailers for the show’s return. These aren’t nightmares. It’s happening. That’s the lesson to take away from the final trailer for Stranger Things 2 – because yes, Netflix has dropped a new teaser upon us just in time for Friday the 13th. With only 13 days to go until Season 2’s release, there’s never been a better time to start getting in the Stranger – because if it’s actually happening, surely it’s happening for a reason…? Thought 2017 was a weird year? Try 1984 on for size. Gremlins, ghosts, cyborgs, sunspots, that mysterious boy who disappeared a year ago in Hawkins, Indiana? All episodes of Season 2 will arrive on 27th October. 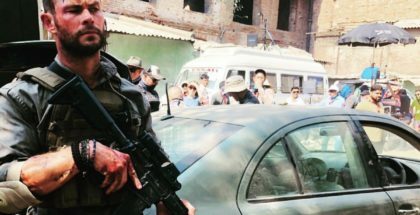 For more, read on below for a nifty thriller of a trailer – or head this way for new photos of the most recent cast additions. Season Things Season 2 just unveiled a thriller of a trailer – literally. The retro sci-fi/horror series was one of the most talked about shows of last year, after it premiered on Netflix in the summer and became a sensation. The show broke free from its genre appeal to become a mainstream success, winning a whopping 18 Emmy nominations in the process – including one for Shannon Purser’s Barb. When Comic-Con 2017 came around, then, it was less a question of whether the show would get a panel and more a question of when it would be allowed to pack out Hall H. The cast and creators greeted the excited crowd with new footage of the show’s second run, before Netflix debuted a brand new trailer that takes the series’ pop culture references to a new level. The trailer uses Vincent Price’s narration from Michael Jackson’s thriller to reintroduce to the world of 1984 Hawkins, Indiana, a world of Dragon Quest, Ghostbusters and young boys called Will secretly coughing up slugs and having visions of a monster-y apocalypse. “Nothing gonna go back to the way it was. Not really,” warns David Harbour’s Sheriff Jim Hopper. Harbour, of course, was on hand to tease information about Season 2, noting that Hopper would continue his arc after Season 1’s “classic hero’s journey”, although that wouldn’t involve him taking his top off. He also promised justice for Barb, after Purser popped up in the crowd to ask whether Barb will be in Season 2 (she won’t). Millie Brown, also nominated for an Emmy, kept her lips sealed about Season 2, but spoke about the challenges of playing Eleven in Season 1. EP Shawn Levy, creators the Duffer Brothers, Gaten Matarazzo, Finn Wolfhard, Caleb McLaughlin, Matthew Modine, Joe Keery, Charlie Heaton, Natalia Dyer, and newcomers for Season 2 Sadie Sink, Paul Reiser and Dacre Montgomery were also in attendance. Playing Hall H after Spielberg wowed people with a glimpse of Ready Player One, it’s safe to say that Stranger Things is already living the dream. All episodes of Season 2 will arrive on 27th October. Stranger Things Season 2 will premiere sooner than expected, with a new poster revealing the show’s official release date. Netflix’s original series, part-sci-fi, part-horror and 100 per cent 80s nostalgia, was one of the biggest successes of last summer, with the Duffer brothers’ creation bringing us creepy monsters, cool retro costumes and a whole cast of talented young actors. Earlier this year, our first glimpse at the show’s return promised that it would arrive on Halloween, but now, a new poster unveiled by NME confirms that Season 2 will drop on Friday 27th October. 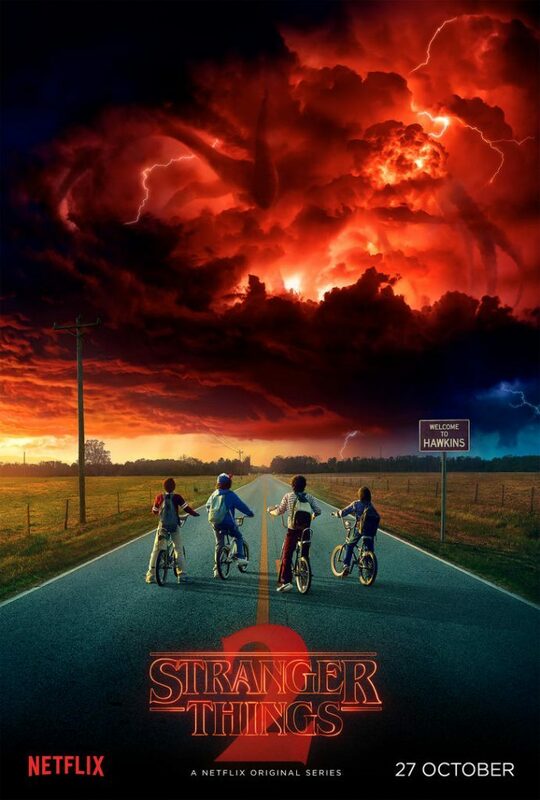 The poster doesn’t reveal much else – although it does give us a taste of the ominous monster threat on the way, which looks to be much, much bigger than the Demogorgon that terrified the proverbial out of us in Season 1. Here’s the poster – you can read on below for the trailer. Or, for everything we know about Season 2 so far, click here. Stranger Things Season 2 will arrive this Halloween, the first trailer for the new season has revealed. 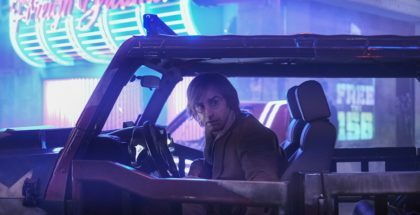 The trailer, which was released for the 2017 Super Bowl, gives us a first proper look at the second run of Netflix’s 2016 summer hit, a nostalgic blend of sci-fi, horror and some of the coolest kids since, well, 1984. That’s when the show will pick up events, continuing to solve the unanswered questions left by the Season 1 finale, from Hopper (David Harbour) getting in that car to The Bathroom Incident to the Eggo sitting out in the words. 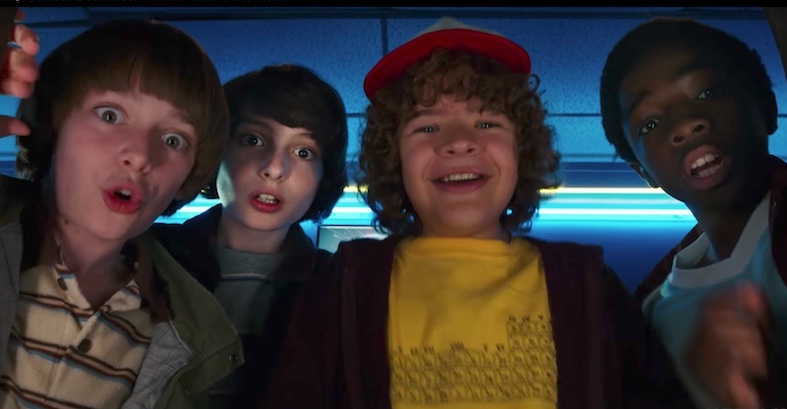 The Duffer Brothers, who created the first season, have promised that Stranger Things will expand its scope a little bit beyond its home town Hawkins, and that new faces will also be joining the cast. 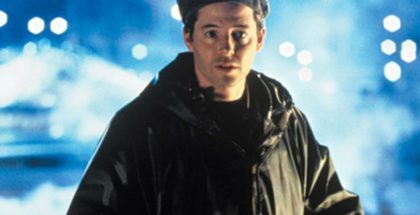 They include Aliens’ Paul Reiser as Dr. Owens, a high-ranking member within the Department of Energy on a clean-up assignment, tasked with containing the events of last year. And The Goonie’s Sean Astin, who will play Bob Newby, a kindhearted former nerd, who went to high school with Joyce (Winona Ryder) and Hopper (David Harbour) and now manages the local Hawkins RadioShack. And, of course, there’s Linnea Berthelsen as Roman, an emotionally damaged, magnetic young woman who suffered a great loss as a child, Sadie Sink as Max, a tough and confident girl whose appearance, behaviour and pursuits seem more typical of boys than of girls in this era, and Dacre Montgomery as Max’s hyper-confident, edgy older step-brother, Billy. 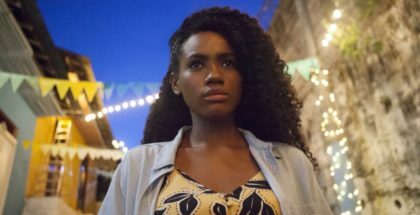 The new trailer suggests that the escalating of the show will also apply to the monsters and the horror, judging by its final shot – but let’s not dwell on that just yet. Because 1984? That’s also when the Ghostbusters came out, which means that – yes – this Halloween we will get the cosplay heroes the world needs right now. Catch up with our reviews of Stranger Things here.